On this day in history, December 5, 1777, the Battle of White Marsh begins. Also known as the Battle of Edge Hill, this was the last battle of 1777 between George Washington's forces and the British army occupying Philadelphia. The battle ensured the British would remain in Philadelphia throughout the winter of 1777-1778, while Washington's army moved to Valley Forge, where it took up winter quarters. The British began what is known as the Philadelphia Campaign by landing 15,000 troops at the northern end of the Chesapeake Bay near Elkton, Maryland, about 55 miles from Philadelphia. 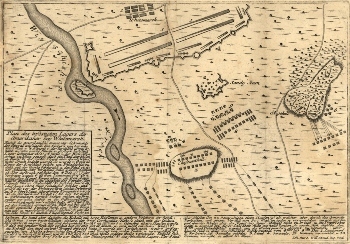 British General Sir William Howe chose this location because the approach to Philadelphia from the Delaware River, which went straight into the town, was nearly impregnable, being guarded by Forts Mifflin and Mercer and a series of spikes in the river that could impale ships just south of the city. Washington's forces were badly defeated at the Battle of Brandywine, the first major engagement of the campaign. After this, Howe was able to march straight into Philadelphia, causing Congress to flee inland to York. Part of Howe's forces occupied Philadelphia, while the main body camped at Germantown, 5 miles north of the city. Washington attacked the British at Germantown in a battle that highly impressed the courts of Europe, even though he lost this engagement as well. General Howe then moved all his forces to Philadelphia to concentrate on the city's defense in October, while Washington set up a formidable system of defensive works just south of the town of White Marsh, 13 miles northwest of Philadelphia. The deep of winter was fast approaching and both sides wanted to make a last effort to attack the other side decisively before they had to take up winter quarters. Very late on December 4, Howe marched 10,000 men north out of Philadelphia. A series of skirmishes took place beginning on December 5 that lasted for the next four days. Howe's different battalions tried to find a way to flank or penetrate Washington's defenses, but were unable. Skirmishes took place around the southern edge of White Marsh on Edge Hill, Chestnut Hill, around Wissahickon Creek and near places with names such as Tyson's Tavern, Sandy Run and Three Mile Run. After 4 days of unsuccessfully trying to find a way to penetrate Washington's line, Howe decided to turn back. His troops were running low on supplies and it was extremely cold at night. His men had not brought overnight gear such as tents, so they were sleeping in the open air. With that, Howe withdrew to Philadelphia where his men made winter quarters. The British had lost 120 men killed, wounded or missing and suffered over 200 deserters at the Battle of White Marsh. The Americans lost 200 men. 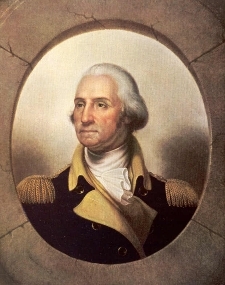 George Washington was disappointed that he had not been able to draw Howe into a larger battle at White Marsh, but he also conceded that it was time to winter. On December 11, 10,000 troops began to march to Valley Forge, Pennsylvania, where they would spend the brutal winter of 1777-1778. Learn more about the winter at Valley Forge here.